By Alyssa Gabriel Seahorse Savvy is a seahorse hatchery located on the Eastern Shore of Maryland, owned and operated by two biologists, Kyle Martin and myself. We produce thousands of captive bred seahorses every year. 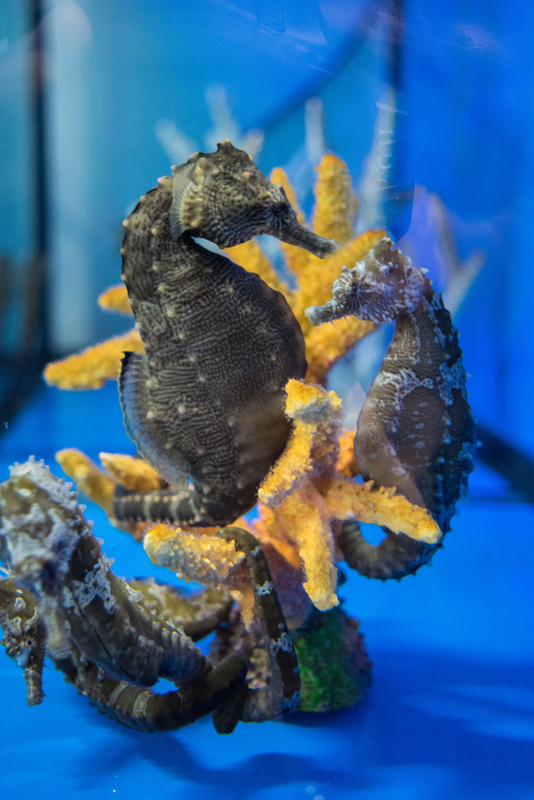 Seahorse Savvy is partnered with Pacific East Aquaculture, a state licensed coral aquaculture facility in Maryland and our seahorses are sold retail, wholesale, to public aquariums, and to research groups. At Seahorse Savvy we work with five species of Hippocampus: H. erectus, H. reidi, H. barbouri, H. comes, and H. zosterea, with plans to further expand this list by the end of this year. We consider H. erectus the easiest seahorse to keep in home aquaria, and have the highest success rates in rearing this species. H. erectus is a great seahorse for beginner hobbyists because of their hardiness in an aquarium. About Seahorses Syngnathids, the family of fish that include seahorses, pipefish, and sea dragons are the most evolutionarily-derived teleost (boney) fish. Seahorses are unique in the Animal Kingdom because the male is the one who becomes pregnant. It is a true male pregnancy in which the male internally fertilizes the eggs after they are transferred to him by the female. After fertilization inside his pouch the eggs are distributed and attach to the lining of his pouch. A placenta-like structure surrounds the eggs and supplies them with nutrients. 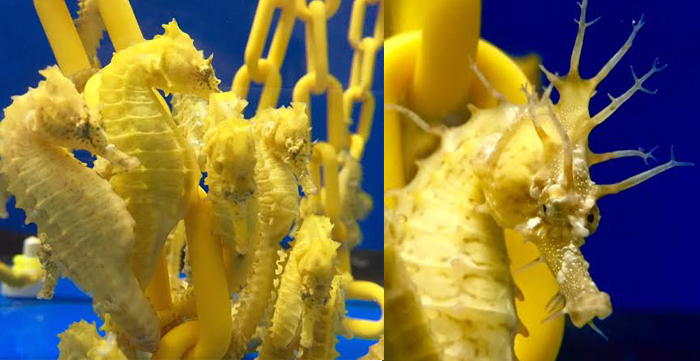 After 14-21 days the male seahorse gives birth to 100-1500+ fry. These fry are approximately 1 cm in length at birth. The number and size of fry a seahorse can produce varies among different species of seahorses. In captivity seahorses tend to pair up fairly easily. Bonded pairs display to each other and show courting behavior every morning and evening. Generally, the male will begin quivering and lighten in color next to the female, and if she accepts she will follow and display the same. This behavior is fascinating to watch. In captivity you can expect larger varieties of seahorses to live for at least 4-7 years with proper care. There are keepers who claim to have kept specific individuals for over 12 years. Hatchery Overview Currently the Seahorse Savvy hatchery has over 3000 gallons of water between all of our systems, and we are continuing to expand. Our breeding pairs are housed primarily in 55 gallon drums. We like using these drums because of the height they provide – 32 inches deep. Seahorses preform a mating dance where the male and female rise together, line up and the female transfers her eggs to the male. Our 55 gallon drums provide adequate height for our large pairs to successfully breed. Each drum has a center stand pipe covered with a custom fry-blocking guard. The guard is used to keep newborn fry from going down the drain until we can carefully collect and count each one. After collection we move the fry to a hatchery system. Our fry hatcheries consist of 20-gallon muck buckets with a center stand pipe and guard with horizontal circular water flow. Each system has two muck buckets over a 20-gallon sump where the filtration is housed. We keep up to 700 fry in these systems, and lower the density as the fry grow. Once our juvenile seahorses are completely weaned to frozen Mysis shrimp at around 6-8 weeks of age, they are moved to 75 to 250 gallon grow-out aquariums. Here the seahorses continue to grow until they are ready for market around 4-6 months of age. Currently Seahorse Savvy houses between 3500-5000 seahorses of all different ages at a given time, which is a lot of little mouths to feed! We start all of our fry on nauplii of Artemia brine shrimp. Artemia are hatched and grown out for 24 hours, and we then enrich them for 24 hours before feeding with a specially designed enrichment for seahorse fry. Live adult Artemia are shipped in weekly and are introduced to fry around 3-4 weeks of age to start getting the fry used to eating larger food items. This helps with the weaning process to frozen Mysis shrimp. At around 5 weeks of age we begin offering chopped frozen Mysis shrimp. 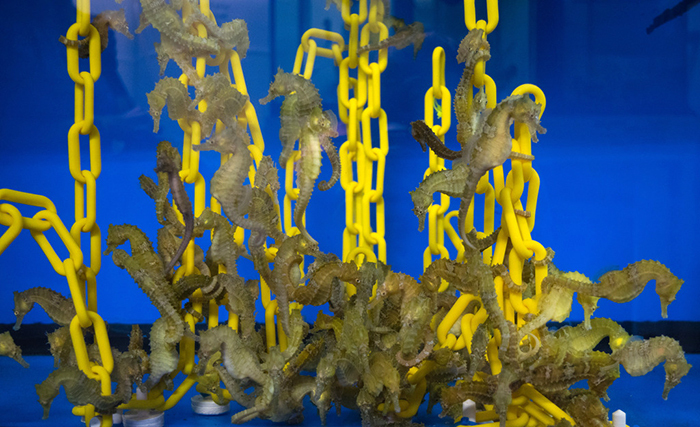 Typically, our seahorses are weaned to whole sized frozen Mysis shrimp by 6-8 weeks of age. We fed our fry 4 times daily, and our juveniles on frozen Mysis shrimp 3 times daily. The broodstock is also fed three times daily. To give you an idea, when we thaw Mysis shrimp for a feeding we generally thaw 2-3 pounds of food. We easily go through 6-10 pounds of frozen shrimp a day! When feeding frozen Mysis shrimp, we rinse it thoroughly under cold tap water. This helps tremendously in keeping our systems clean, and we highly recommend this to other seahorse keepers. Each seahorse brood is housed in their own separate system, and we never mix batches when rearing so there are a lot of systems to maintain. 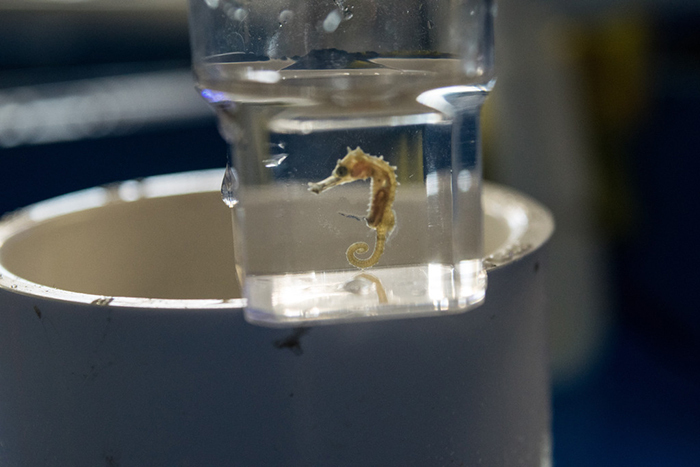 With heavy feedings it is extremely important for us to keep our systems pristine to keep our seahorses healthy. We siphon waste multiple times daily and also wipe each system down several times a day. Siphoning serves as a daily water change, and wiping the system eliminates biofilm. 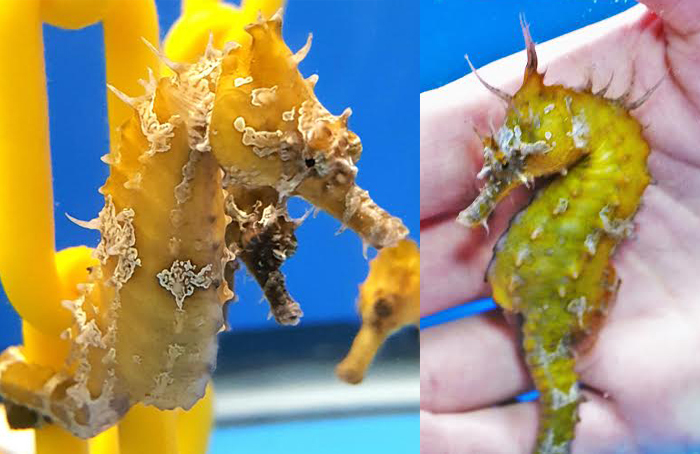 Biofilm will begin to grow on all surfaces of the grow out system from the heavy bio load and can negatively impact seahorse health if left unchecked. Every system has a large over-sized protein skimmer, UV sterilizer, heavy biological filtration and 100-micron filter socks to catch debris. All skimmers are cleaned and all filter socks are changed at least once daily. Rearing seahorses at this level is an extremely intense labor of love. We work 12+ hour days, 365 days a year. There are never any sick days or vacation days. They keep us very tied down, but we do it because we love working with these species. While not a very profitable venture, it is very rewarding personally to produce high quality seahorses that will do well and thrive for other hobbyists. Keeping Seahorses in Home AquariaAquarium SizeH. erectus, H. reidi, H. comes, and other species of standard size seahorses reach 5-7+ inches in length as adults. These seahorses grow to be large animals. A 30-gallon aquarium is recommended for a pair of standard size seahorses. This is a minimum size; a larger aquarium is even better. An additional 15 gallons is recommended for every additional pair of seahorses. Most hobbyist keep at least two seahorses together as they are very social animals. The height of the aquarium is also important for seahorses as they are vertically-oriented animals. 18 inches is the minimum recommended height, but a taller aquarium such as 24-30 inches is even better. Feeding Our captive bred seahorses are exclusively fed frozen Mysis shrimp. A pair of seahorses can eat about a cube of Mysis shrimp during a feeding. We use both Piscine Energetics Mysis shrimp and Hikari BioPure Mysis shrimp with our seahorses. Seahorses should be fed twice a day, and will appreciate a third feeding if possible. A “feeding station” can be used to help make sure your seahorses are getting enough to eat, and to make sure uneaten food is not lost in the aquarium. The idea is to train your seahorses to eat out of a holding container. We use a spiny oyster shell in our display aquarium as it looks natural, and blends in with the live rock. You can use any sort of shell or cup shape item to accomplish this. You will want to make sure whatever object you use is safe to go into a saltwater aquarium. Once you have chosen your feeding station it is best to place it in a lower flow area of the aquarium. This will help prevent food from blowing out. We recommend thawing your Mysis shrimp out using your aquarium water and then rinsing it under cold tap water in a fine mesh net. Place the Mysis in a container with new aquarium water and use a turkey baster to gently squirt the food into the feeding station. It can take a little practice to get the food to settle into the feeding station. It is easier to get the food to settle into the feeding station if you defrost the Mysis shrimp in aquarium water. We have found when thawed in freshwater the Mysis absorbs some of the freshwater, becomes less dense, and floats away from the feeding station. It can take up to a week or two for your seahorses to learn how to eat at a feeding station. Once the seahorses are trained they will be waiting at their feeding station every morning and evening for their meal. Temperature The water temperature recommendation for seahorses is cooler than most reef aquariums at 70-74F. Many aquariums can be cooled to this temperature using a simple clip on fan, but a chiller may be needed in some cases. The reason for keeping the aquarium cooler is to keep nasty bacterial counts down. 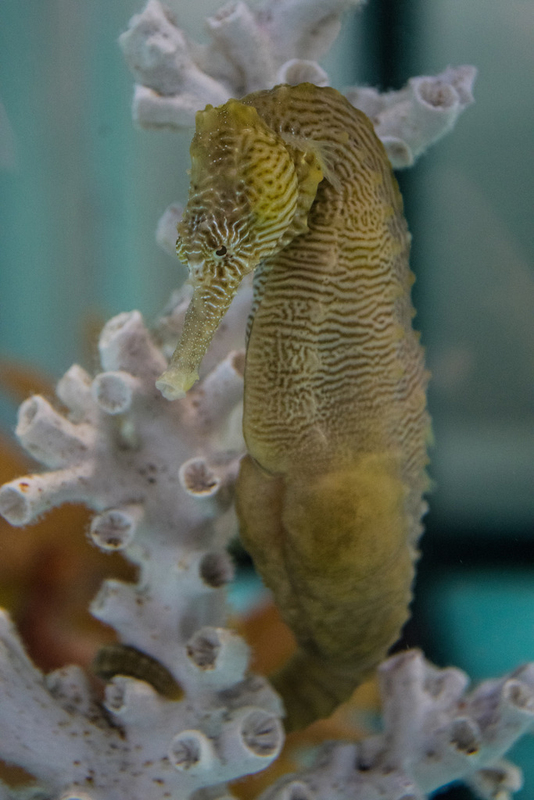 Seahorses have a primitive immune system and are more prone to bacterial infections compared to other fish. With heavier feedings this creates an environment for nasty bacteria such as Vibrio strains to grow. Any uneaten food will begin to harbor these bacteria. With every degree warmer these bacteria exponentially grow. Keeping the water cooler will therefore slow down the growth of these bacteria and help tremendously in keeping your seahorses healthy long term. Aquarium Tank-Mates: Fish and Invertebrates Seahorses do best in a species-only aquarium without other fish. Again, seahorses have a primitive immune system and are more likely to become ill from a pathogen another fish is carrying. They are also slower eaters than most other fish and can be easily outcompeted for food. In addition, seahorses can become very stressed by aggression from other fish. Small peaceful fish such as small Gobies or Cardinal fish are typically fine, but ideally should be captive bred and quarantined before kept with your seahorses. Most cleanup crew invertebrates are also safe to keep with seahorses. These include blue-leg and red-leg hermit crabs, snails such as Astrea, Nassarius, Cerith, and ornamental shrimp such as Skunk or Fire Cleaner Shrimp (Lysmata spp.). Larger Peppermint shrimp are also safe to keep with your seahorses. Seahorses may go after smaller Peppermint shrimp and eat them. Most soft corals are considered safe to keep with seahorses. Live photosynthetic Gorgonians are by far our favorite coral to keep with seahorses. They are very easy to keep, come in a variety of shapes and colors, and the seahorses love to hitch on them. They can really make a great display. Of the photosynthetic Gorgonians my favorites are Corky Seafingers (Briareum asbestinum), Slit Pore (Plexaurella spp.) and Purple Knobby Gorgonians. These varieties are very hardy and are thicker branching which seahorses tend to prefer. 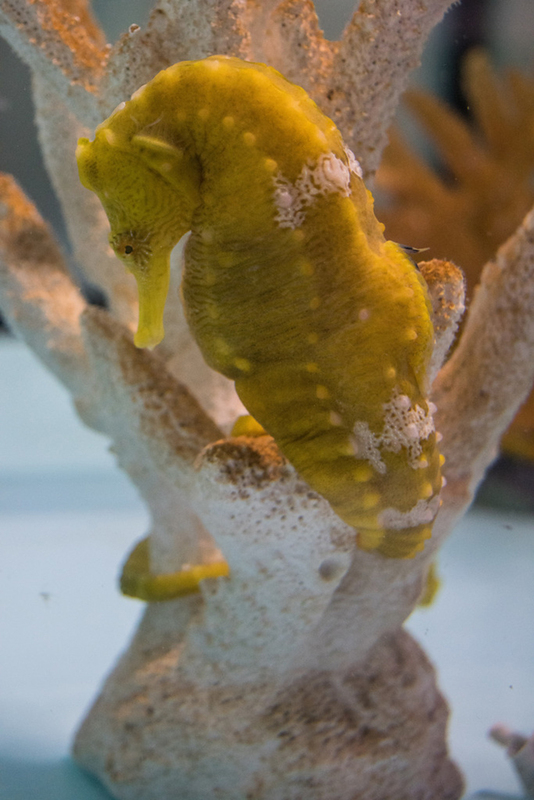 Live sponges, such as orange and red tree sponges are nice to have as they are colorful hitching posts for seahorses. Soft corals such as varieties of Leathers corals, Ricordeaflorida, Discosoma mushrooms, Sympodium, Cespitularia and Zoanthids can also be kept with seahorses, and can really add some color and diversity to your aquarium. Many hobbyists also like to keep an assortment of macroalgaes with their seahorses. Helpful TipsPromoting Brighter Colors I like to refer to seahorses as sea chameleons. Like chameleons, seahorses have independently moving eyes. They are one fish who will stare you right in the eye. In addition, the have the ability to change color. There are still a lot of unknowns about seahorses and why they change color, but diet, mood, and tank environment seem to be major factors. Genetics and courting also play a role. Seahorses can even get a “sun tan” and become darker under more intense lighting, and also tend to darken if stressed. Good water quality will help promote better color in your seahorses. Most hobbyists want their seahorses to display bright coloration. 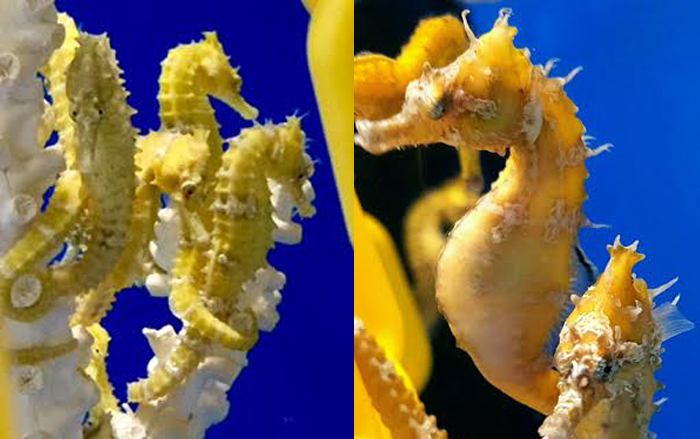 Having yellow and orange hitching posts for your seahorses to hold onto will help promote these colors. Likewise, white hitching posts promote lighter coloration. A vibrant blue aquarium background tends to bring out brighter more yellow coloration and lighter blue background will bring out more pastel coloration. A black aquarium background as well as dark substrate promotes dark coloration. Substrate It is much easier to be successful long term with a bare bottom seahorse display. Having no substrate will allow you to easily keep detritus from building up in the aquarium. Detritus, like uneaten food, is likely to harbor nasty bacteria. Keeping your aquarium detritus free is key to long term success. If you prefer a sand bed you can still be successful but it can be a bit of a challenge. Filtration, Water Flow and Maintenance I cannot stress enough how important good filtration and water flow are in your seahorse aquarium. One of the most common misconceptions we hear when talking to new hobbyist is seahorses require a low flow system. Any large scale breeder including myself will tell you this is not true, and you will not be successful keeping seahorses this way. It is very important to have moderate to even a little higher water flow to properly circulate your aquarium. This will help keep detritus from building up and help maintain your water quality. Any additional powerheads should be covered so the seahorses do not grab on and injure themselves. As long as there are some areas your seahorses can rest and plenty of hitching posts your seahorses will enjoy some of the high flow areas. We catch our seahorses in our display and even our juveniles in grow-out playing in the return areas or where water flow is high. Seahorses are very intelligent animals. Large healthy captive bred seahorses will quickly learn where higher flow areas are and will not be caught off guard as long the water flow is not random. Weekly 10-25% water changes are a good rule to go by. Of course the amount of water you change is dependent on stocking density, how much filtration the aquarium has, and other factors. A high quality, over-sized protein skimmer is a must, and while not mandatory, a UV sterilizer is very useful. All of our systems have large over-sized protein skimmers and UV sterilizers. At our hatchery we would not be successful without these two pieces of equipment. 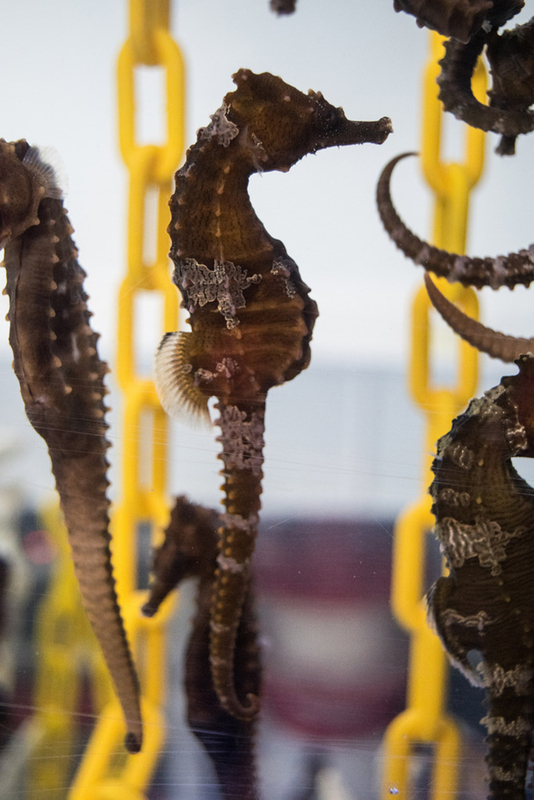 Thinking About Keeping Seahorses in your Home? With easy access to new and improved technology and the availability of high quality captive bred specimens, seahorses are much easier to keep than in years past. In the past, most seahorses available to the aquarium trade were either wild collected seahorses or seahorses raised in net pens in the ocean. Wild collected seahorses are known to harbor many different parasites. The process of wild collection, importation, and ultimately arrival at your home can be a long and stressful one. These seahorses often have not been well fed, and can be very weak animals, typically only taking live foods and sometimes even refusing to eat anything. Net pen raised seahorses are not true captive bred animals. These seahorses are raised in nets in the ocean where they can be exposed to different pathogens and also forage for whatever comes by. These seahorses are also known to be finicky eaters and often very small in size when imported into the U.S. or other regions. Both of these categories have given seahorses a bad reputation as difficult animals to keep. True captive bred seahorses have never been exposed to parasites as they are raised in closed systems. These seahorses are already used to life in captivity as they do not know anything different. Most importantly, they are fully accustomed to eating frozen foods. Seahorses are fascinating and intelligent animals. Each is an individual with its own personality. These interactive little fish will melt your heart! 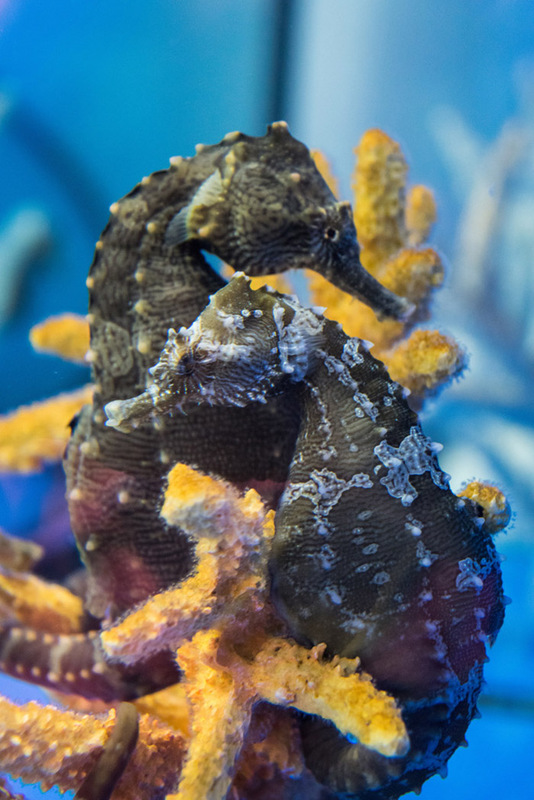 With new advances and better understanding of their husbandry requirements, seahorses can be successfully kept in a home aquarium and enjoyed for many years. If you are interested in keeping seahorses, please contact us. We are happy to try to answer any questions you may have about setting up an aquarium for them and keeping seahorses. We are excited to share our hobby with you.